How about bacon and eggs or pancakes for breakfast? 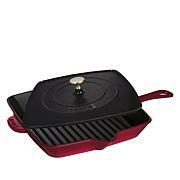 With this durable cast iron griddle you can have breakfast any time of day. 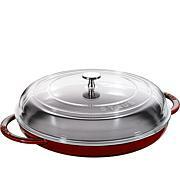 It offers the fast, even heating of traditional cast iron formed by the expertise of French chefs. 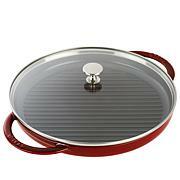 The interior enamel coating also gives you a culinary advantage for better braising, roasting and caramelizing. 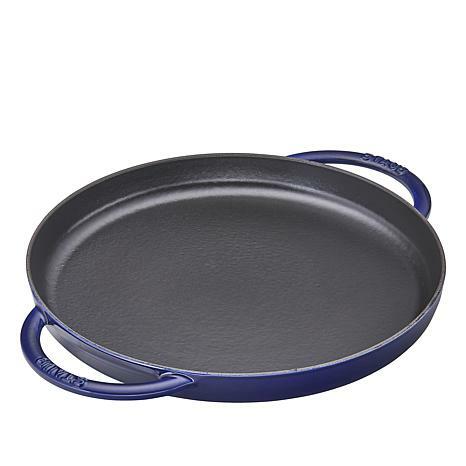 Keep this pan handy, you'll find yourself reaching for it again and again. 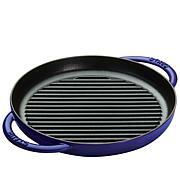 This griddle heats up quickly and is well made. It has some heft to it but not too heavy. I toasted a turkey and cheese sandwich, and it turned out beautifully. I am very pleased with this griddle and highly recommend it! This pan is heavy!! Consequently it cooks food quickly and keeps it moist. I used it for scrambled eggs and it was a breeze. Easy to clean up too. It is so attractive I leave it out on a bakers rack. This is my third piece of Staub, I love it.